Compatible with various Intel and AMD sockets, the GamerStorm Captain 240 Pro Liquid CPU Cooler is designed to keep your CPU cool while adding a dash of style to your PC build. Equipped with two 120mm fans, the Captain 240 Pro features addressable RGB lighting that supports motherboard sync control, or you can customize the lighting effects using the included controller. An automatic pressure-relieving radiator is designed to prevent coolant leaks, while the cooler's two-chamber design helps to boost circulation efficiency. The zirconia ceramic bearings and axis are built to isolate operational noise from the water pump. With this patented technology, pressure within the circulation system is designed to be released into the air, which helps to prevent coolant leaks. A dual-chamber design in an integrally formed water block helps to boost circulation efficiency. 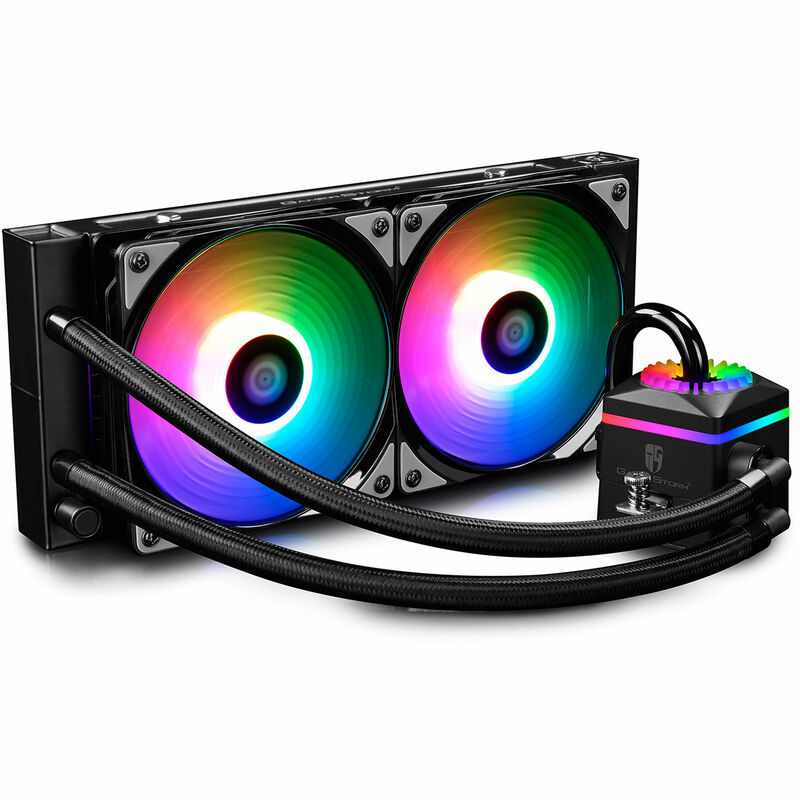 The lighting on the pump and the fans both feature addressable RGB, allowing for almost unlimited customizable lighting schemes. Meanwhile, the pump LEDs are positioned outwards. Control the cooler's RGB lighting effects through the sync control of your supported motherboard or using the included controller. The Captain Pro also comes with a 6-port RGB hub. The WS2812B ADD-RGB LED strip is compatible with 5V/D/G and 5V/D/NC/G 3-pin ADD-RGB headers. The U-shape glass pipe makes the liquid flow clearly visible while adding an industrial look. Diamond-quality zirconia ceramic bearings and axis are designed to isolate operation noise from the water pump as well as provide a longer lifetime. The pump is powered by a three-phase winding motor, which is designed to provide a continuous driving force. Injection-type micro water passages are designed to allow the copper contact surface to be fully utilized for heat absorption.